Welcome to Dyan Garris Oracle Decks buying page. We are closing out all of our physical, printed oracle decks in 2019. Right now we have all in stock and ready to ship. Choose from these 4 oracle decks for only $19.99 each. 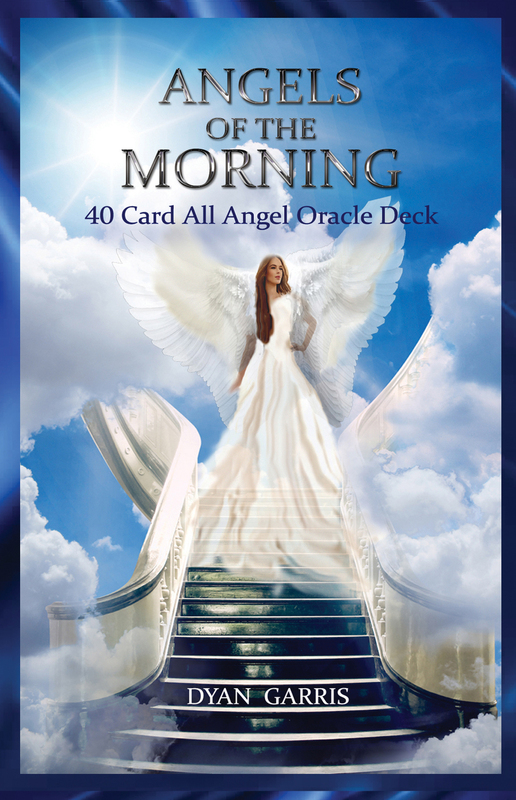 Angels of the Morning is an all angel oracle deck of 40 cards. 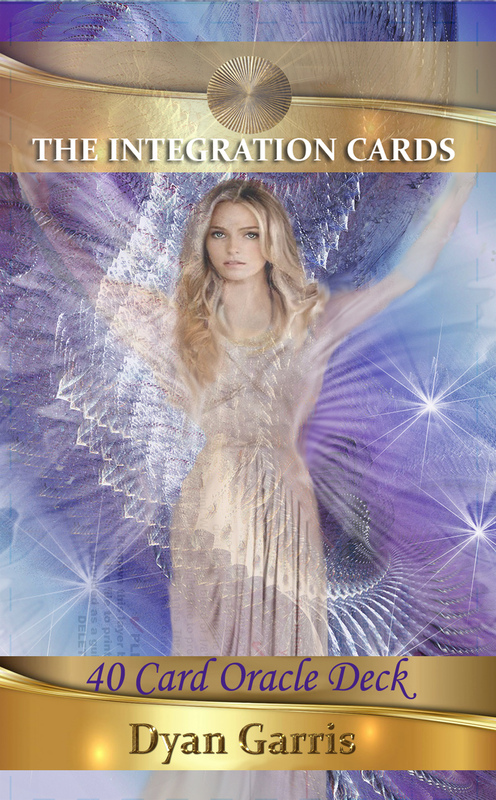 The Integration Cards is 40 cards with 9 angels of integration. 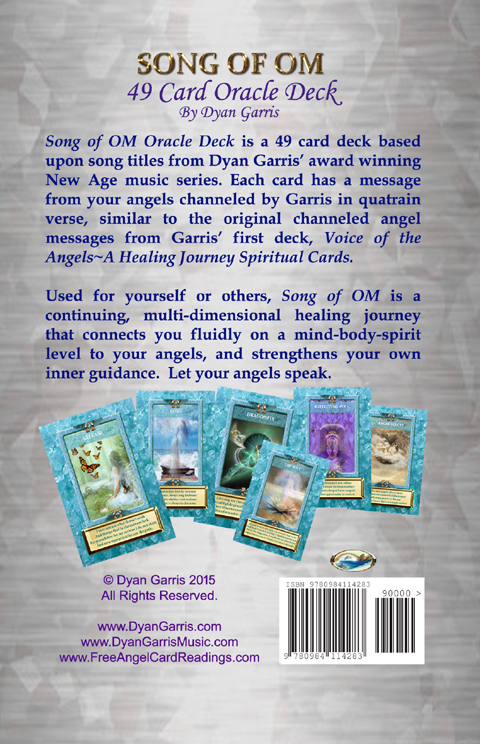 Song of OM is 49 cards, with several angels in it. 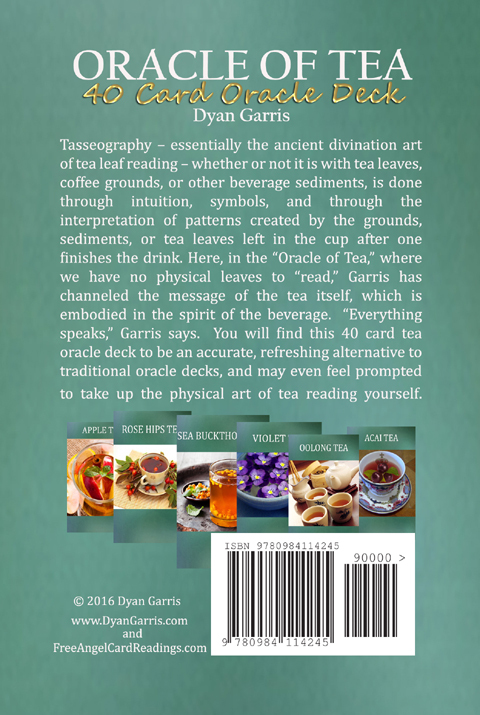 Oracle of Tea is 40 cards, fun, fast, light, and very accurate reading. All decks are full TAROT SIZE, made in the USA from high quality playing card stock, and come in a sturdy 2 piece box. All have full instruction booklets included. We will be taking this ALL ANGEL oracle deck out of print in 2019. They are on sale now at our CLOSE OUT SALE PRICING. We only have a few decks left and when they’re gone, they’re gone forever. 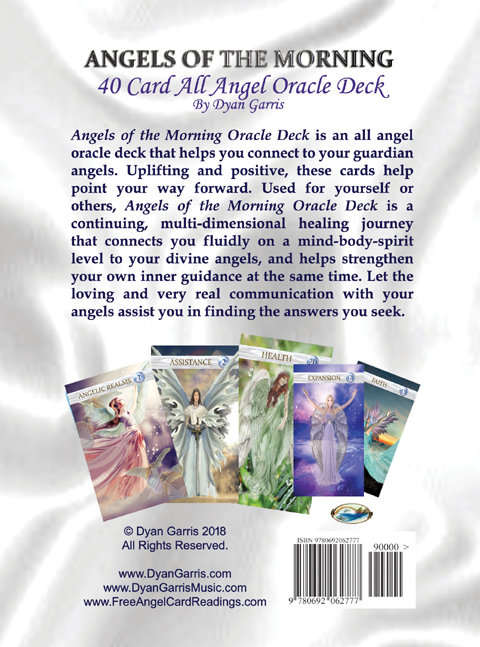 Angels of the Morning Oracle Deck by Dyan Garris is a 40 card, ALL ANGEL oracle deck. The cards are high quality playing card stock, printed in the USA. They are TAROT size, and come with a full color instruction booklet/card interpretations, in a sturdy 2 piece, top lifting box. We will be taking this angel oracle deck, and the others, out of print. They are on sale now at our CLOSE OUT SALE PRICING. We only have a few decks left and when they’re gone, they’re gone forever. Buy yours now! 40 card oracle deck, high quality playing card stock, printed in the USA, Tarot sized deck in a two piece, top loading box. Comes with instruction booklet inside. 9 angels of integration. Dyan Garris angel card oracle deck. Now, finally, with “The Integration Cards,” by Dyan Garris, oracle decks, angel cards, chakras, and integration of mind, body, and spirit, are taken to new and higher levels. This 40 card oracle deck is not only designed to help you connect with your angels, and to help bring clarity to your situation or concerns, but also—and most importantly—to help you bridge the gap of integration between mind, body, and spirit that we hear so much about but may not know how to accomplish. 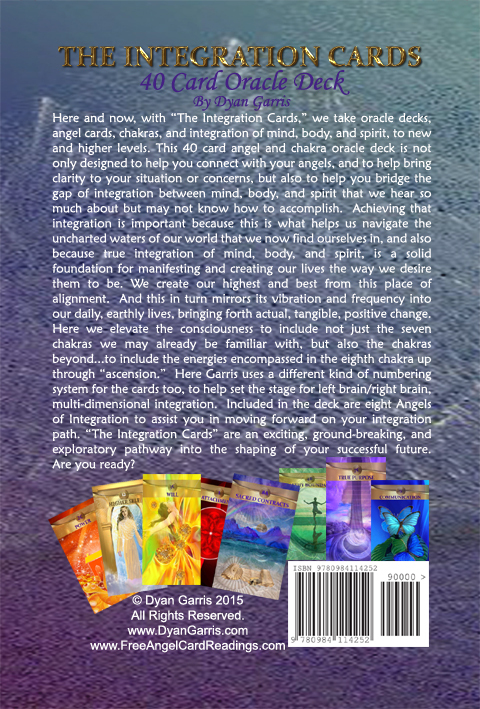 40 card Tarot size angel oracle deck. Includes 9 Angels of Integration. Box is 2 pieces with a top lifting separate lid. Instruction booklet included. We will be taking this oracle deck out of print. They are on sale now at our CLOSE OUT SALE PRICING. We only have a few decks left and when they’re gone, they’re gone forever. Buy yours now! Years ago, my friend took me to a lady who did tea leaf readings. I was fascinated with this lady’s ability to give me an accurate, and quite extraordinarily detailed reading from the tea leaves in the bottom of my tea cup. From these little tea leaves, that didn’t even look like “leaves” to me, she came up with real names, real people, and real scenarios that actually all came to pass. I didn’t get a chance to visit her again, but I never forgot it. My mother, too, sometimes used to read Greek coffee cups as fun after dinner entertainment. She also was quite accurate in her readings. The reading of tea leaves and even Greek coffee cup readings, is an ancient art of divination passed on through many generations. It’s called Tasseography (καφεμαντεία in Greek). Essentially, all Tasseography, whether it be with tea leaves or with coffee grounds, is done through intuition, symbolism, and through the interpretation of patterns left by the grounds or tea leaves in the cup after one finishes the drink. 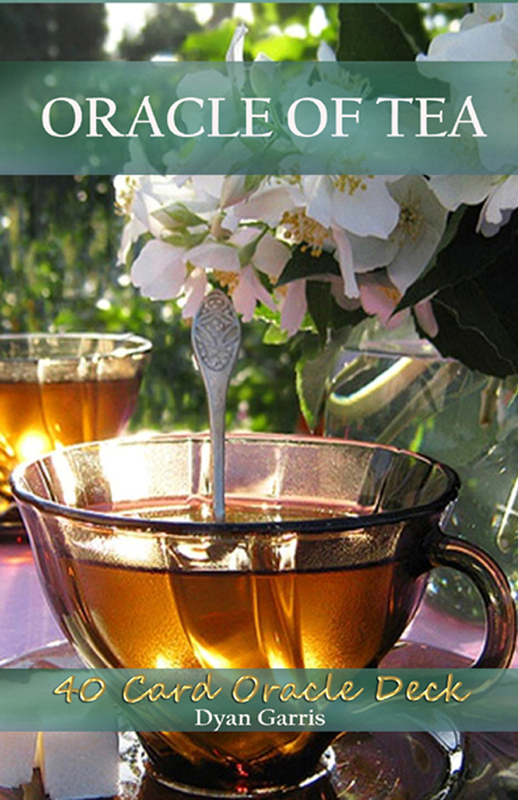 I’ve wanted to create a tea oracle online for a long time, as a fun alternative to angel card readings. And as I searched I couldn’t find an online tea leaf reading that really spoke to me or that was even remotely accurate. So Oracle of Tea was born. This 40 card oracle deck is Tarot size, printed in the USA on high quality playing card stock, and comes in a 2 piece box with a top lifting lid. Instructions and interpretations included. 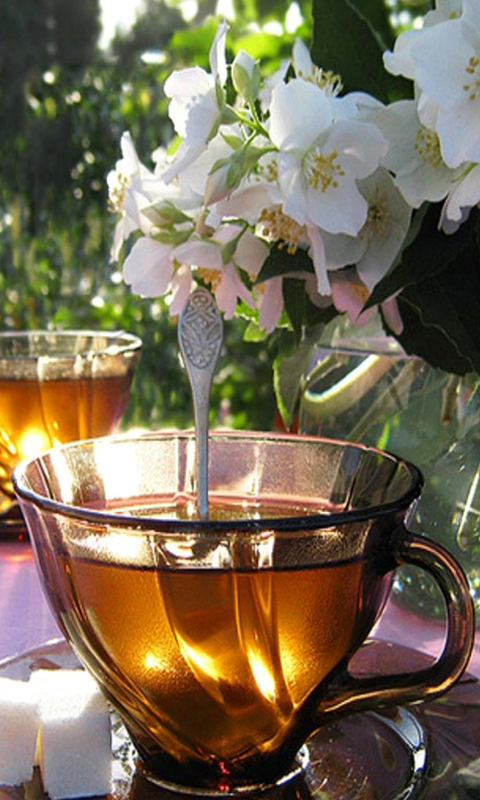 Fun and different, Oracle of Tea is a truly helpful tool to you on your spiritual path. We will be taking this angel oracle deck out of print. They are on sale now at our CLOSE OUT SALE PRICING. We only have a few decks left and when they’re gone, they’re gone forever. Buy yours now! The 49 card oracle deck by Dyan Garris – Song of OM Oracle Deck. 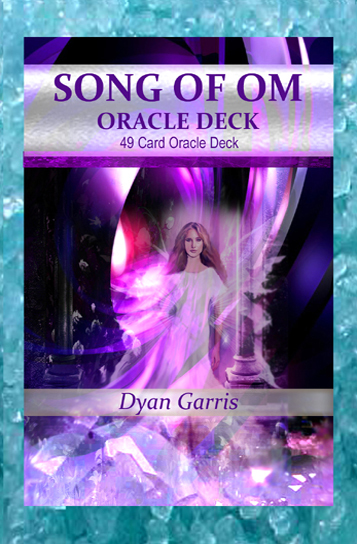 Song of OM Oracle Deck is a 49 card oracle deck based upon song titles from Dyan Garris’ multiple award nominated series of music and guided meditation. Each card has a quatrain verse message for you from your angels. The deck is TAROT SIZE, printed on high quality playing card stock in the USA, and comes in a two piece box with instruction booklet inside. There are animated free angel card readings available online here: Free online reading with Song of OM HERE. The video showcasing all of cards in the deck is below.